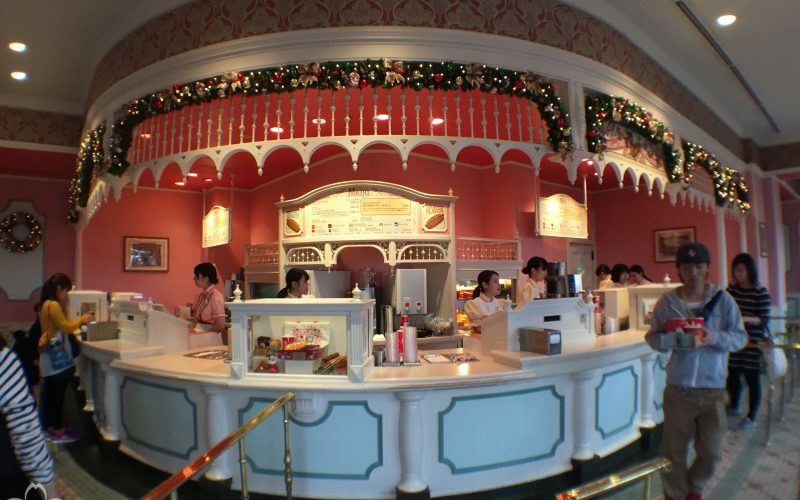 One of the best things about Refreshment Corner is that it’s just really convenient. 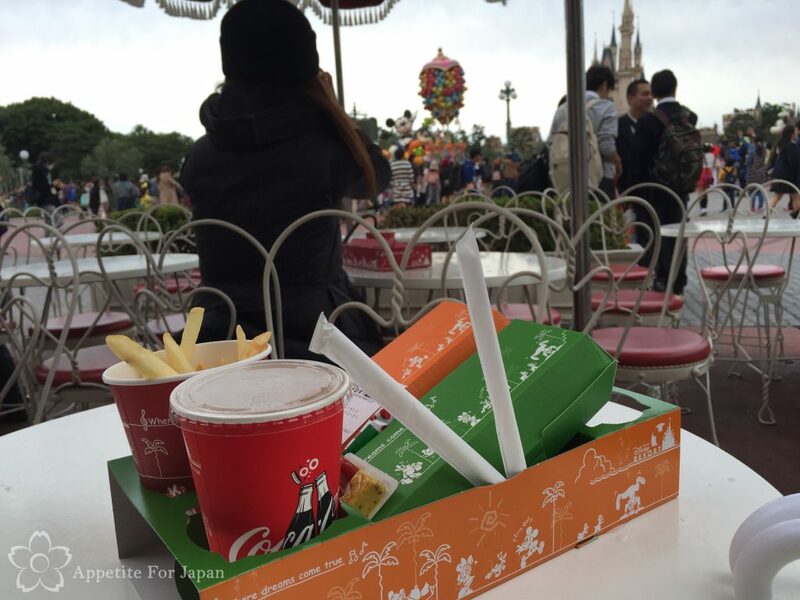 It’s one of the first eateries you’ll encounter at Tokyo Disneyland, it has food that you can carry to another area if need be, it’s inexpensive, and it has great views of Cinderella’s castle. In fact, when we stopped there for lunch, the parade was in full swing and, as you can see in the above photo, we were able to see part of it from where we were sitting. There’s not a lot to say about the food as they have a small menu of just a few different hot dogs, along with hot chips (fries, for my American readers) and a token cup of salad. 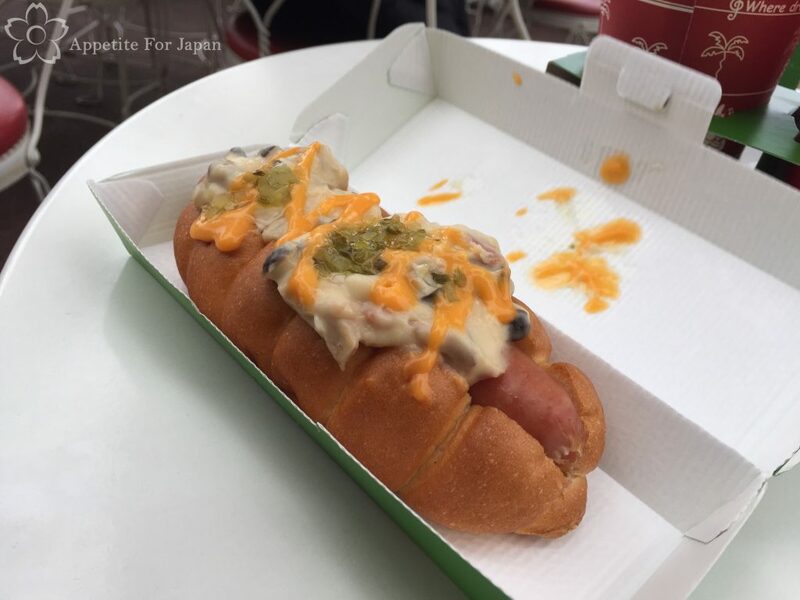 Hot dogs range in price from around 410 Yen for the ordinary ones to 620 Yen for the seasonal specials, and you can get these as a set with chips and a drink. Refreshment Corner changes its menu every so often, and they usually have two or three different toppings such as pulled pork, mushrooms or tomato and olives. They all taste exactly as you would expect, and there’s nothing wrong with that. 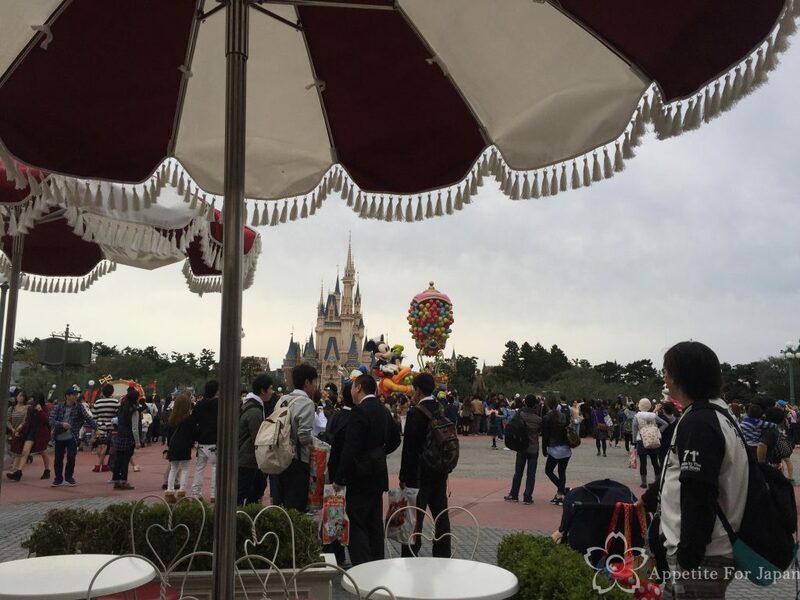 Seating is limited at Refreshment Corner, as is often the case with the counter-service restaurants and cafes. Eating outside of the main meal times and/or during parades will increase your chances of getting a table. Otherwise, the food comes packaged up (see above photo) so that you can easily carry it until you can find somewhere to sit and eat. 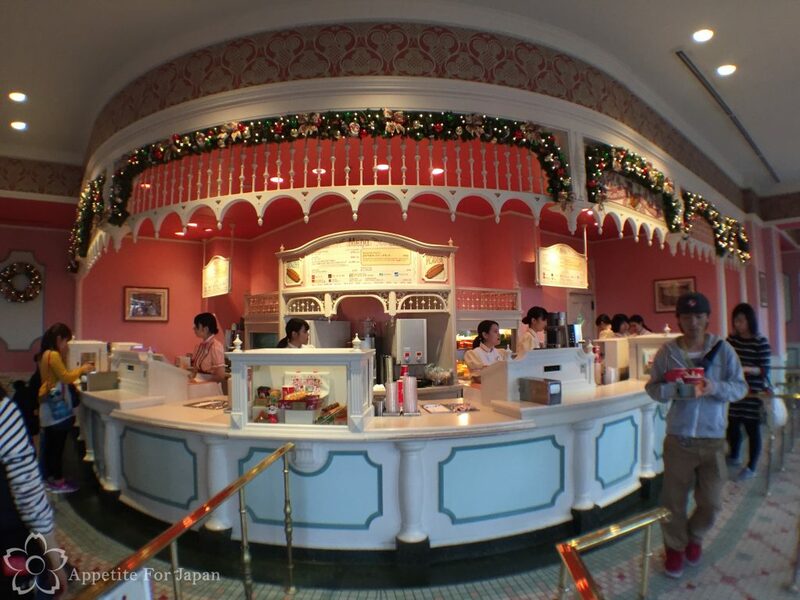 Tokyo Disneyland’s Refreshment Corner is really easy to find. It’s located within World Bazaar. When you walk through the undercover area, you’ll see Cinderella’s Castle ahead. Keep walking until you get to the end of the undercover area, and Refreshment Corner will be literally on the corner, just to your left. You’ll see tables and chairs under large outdoor umbrellas. Would I recommend Refreshment Corner? If you’re looking for a relatively inexpensive lunch and you like hot dogs, then Refreshment Corner is definitely an option to keep in mind. 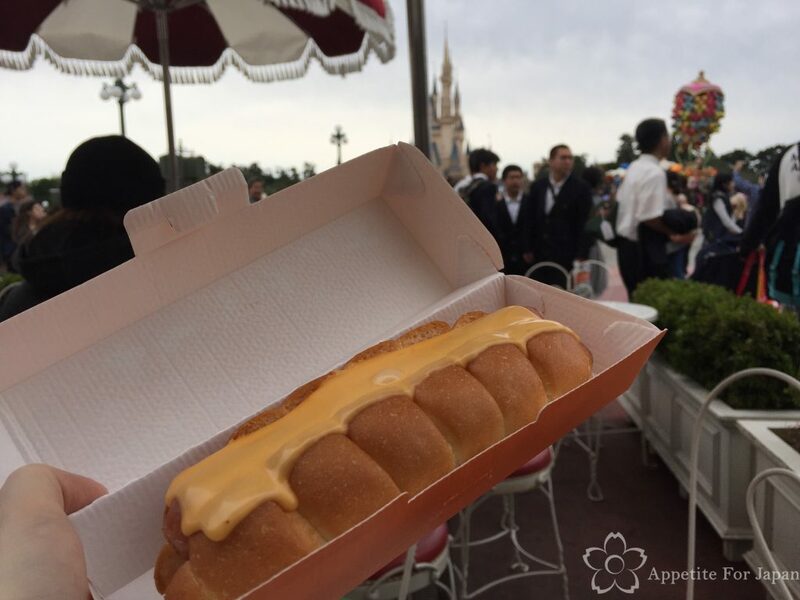 I went to Tokyo Disneyland last Summer and refilled my empty stomach at the refreshment corner just before leaving. No culinary but it does the job.